Aircraft Picture - Waco 10 giving joy rides. Airplane Picture - Waco 10 (or GXE) in the Canada Aviation Museum. 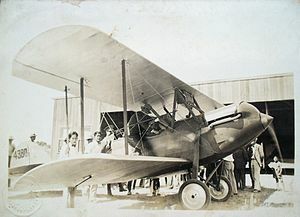 The Waco 10/GXE/Waco O series was a range of three seat open-cockpit biplanes built by the Advance Aircraft Company, later the Waco Aircraft Company. The Waco 10 was a larger span development of the Waco 9, both single engined three seat single bay biplanes constructed around steel tube frames. The wing covering was fabric and both upper and lower planes carried ailerons, which were strut linked. The two passengers sat side by side in a cockpit under the upper wing and ahead of the pilot, who had a separate cockpit. It had a split axle fixed undercarriage and a tailwheel. The main undercarriage was fitted with hydraulic shock absorbers, unusual at the time on a light aircraft. The fin could be trimmed on the ground to off set engine torque and the tailplane could be trimmed in flight. Initially it was powered by a Curtiss OX-5 water cooled 90 V-8 engine producing 90 hp (67 kW). Its first flight was in 1927. It was numerically the most important type to be built by Waco with at least 1,623 built over a period of 7 years from 1927 to 1933 and was fitted with a very large variety of engines of radial and V configuration. The Waco 10 turned out to have attractive handling and there was a ready supply of war surplus Curtiss engines. It was widely used for the popularisation of aeronautics through barnstorming and joyrides, and was also much used as a trainer and by small operators for charter flights. In 1928, after the Waco 10 had entered production, Waco changed its designation system so that the basic model 10, powered by a 90 hp (67 kW) Curtiss OX-5 engine became the GXE. The OX-5 was also used in the Waco 9 and this led to the confusing popular description of both aircraft as Waco 90, after the power. Later aircraft used a three letter designation, the first denoting the engine, the second, S or T meaning Straight or Tapered wing and the final O indicating it belongs to the Waco O series for open cockpit. An -A suffix indicated an armed variant intended for export. Apart from the Curtiss and Hispano-Suiza, all of these engines were air cooled radials. Other engines were fitted experimentally, without unique designations, including Rausie, Siemans, and the 115 hp (86 kW) Milwaukee Tank engine. This was an air-cooled version of the Curtiss OX-5, and was intended as an aircraft engine. Two mailplane derivatives from the O series (types JYM and JWM) were single seaters with a 14" stretch in the fuselage. Airplane Picture - 1929 model Advance Aircraft Company Taperwing ATO of Vintage Wings of Canada. Airplane Picture - Waco CTO of 1929 at Marine Corps Air Station Beaufort South Carolina, in April 2004. Kobernuss, Fred O. Waco - Symbol of Courage and Excellence unk : Mystic Bay Publisher, 1999. ISBN 1887961011.